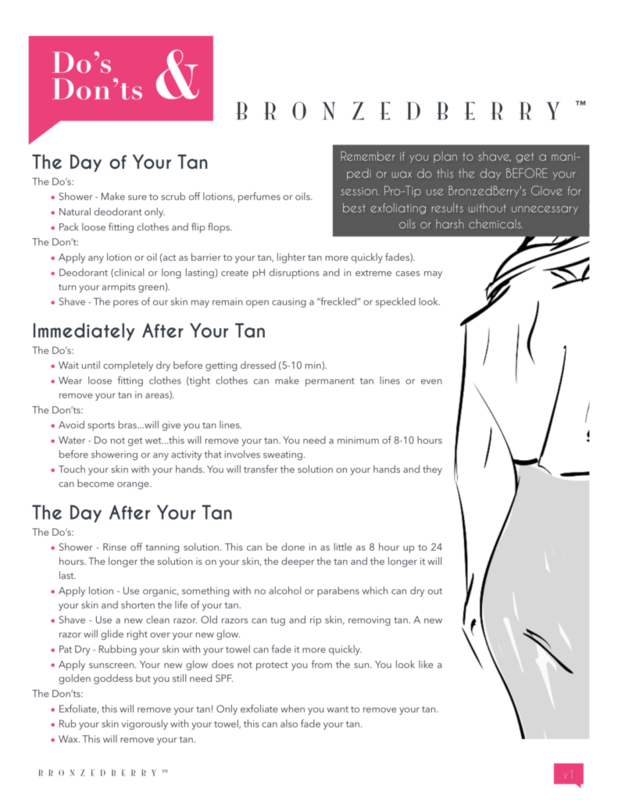 BronzedBerry provides answers to the most frequently asked questions about spray tanning. Common questions are, “how do I get the best spray tan”, “how long does a spray tan last”, “what’s an organic spray tan”, “how do I prepare for my spray tan”, and more. Getting the best spray tan has a lot to do with how a client prepares their skin, what they wear and how long they leave tanning solution on their skin. The best spray tan of your life has a lot to do with the choices a client makes. We’ll break this down in 5 simple steps. Watch directly after your spray tan session to ensure you are dry and you know how to take care of you new spray tan. Don’t leave it up to chance! The answers to the most frequently asked questions are below. We’re dedicated to providing a safe alternative to UV tanning. We specialize in natural looking everyday spray tans and provide a “never orange” guarantee. Book a local artist in your area on our Appointment page or come see us in our studio. Whatever you do, wear sunscreen and tan safely…with a spray tan. * BronzedBerry is not offering health or medical advice. Please consult with your physician if you have questions.Our answers are based on experience and current medical research available. How should I prepare my skin before my spray tan session? Your skin is a canvas for the spray tan artist and it needs to be in the condition so that the spray tanning solution can develop properly. Begin every session with clean and dry skin that has been exfoliated properly but do not shave (see below). Tip – The best exfoliation is using a special mit with no oils, just your own soap. Try ours here, or use a washcloth. Avoid exfoliation products, they contain additional ingredients that can actually BLOCK your tan. Avoid lotion, moisturizers, perfume, and deodorant (especially clinical strength) after you’ve exfoliated. Any of these can negatively affect your spray tan results as they block the solution and cause pH disruption, which in turn can affect the way your tan looks and smells. Do not shave before your session! We can’t stress this enough. Shaving opens the pores of your skin and allows the solution to be absorbed then trapped in your pores. This can result in a robin’s egg speckled look on your legs as the solution is caught in your pores. Avoid this by simply not shaving, don’t stress you’ll be able to shave after the tan has developed. Regardless of brand or solution, a spray tan will last a maximum of 7 days. Spray tans only change the outermost layer of your skin. Generally, most people will lose that outer layer of skin between 5-6 days. When that skin naturally sloughs off, so does your tan. Spray tans and sunless tanning creams only penetrate the top epidermis (top layer of skin) so it can only last as long as the skin is present on the body. Solutions claiming to last longer, are simply advertising falsely and we encourage you to be wary. Some clients can experience a longer result with a spray tan if their skin is well hydrated, they don’t sweat or bath very often. Rubbing of skin in baths and showers or with towels will rapidly deteriorate a spray tan. The same goes for pools, spas, massages, and frequent rubbing of skin with a towel. When can I shave, wax or get a manicure and pedicure with my spray tan? Avoid destroying your new spray tan by following our timeline suggestion for your beauty habits. Waxing – Must be done 24-48 hours prior to your tanning session. Its ideal to have 2 showers in between your waxing and spray tanning session. Wax residue can act as a barrier for the tanning solution. Shaving – Do not shave before your session. Wait until your first shower, after your tan has developed and use a new clean razor along with shave gel. Shaving the same day as your spray tan session can cause uneven absorption of tanning solution on your legs and it may result in a speckled look. Mani/Pedi – If the goal is to have an even spray tan from head to toe get your manicure and/or pedicure at least one day prior to your tanning session. Make sure that all the oils, scrubs and lotions have been completely exfoliated off before getting your spray tan. If that’s not possible, continue with manicure but opt for a polish change only on your toes. Do not soak your feet or have your legs scrubbed after your tan, this will remove it completely. How long before I can get wet or take a shower after my spray tan? Be honest with your Artist about when you plan on showering, she/he should customize your solution based on your answer. Leaving a solution on longer than it’s recommended will result in the dreaded orange look we all want to avoid. Most solutions require a minimum of 8-10 hours. Ask your Tanning Artist and follow their instructions. Once it’s developed you can shower! But remember, do not rub your skin with a washcloth or any exfoliating products as this will drastically fade your spray tan. Finally, you can shave! Make sure to use a clean, new razor so that it does pull on your skin. We recommend using a shave gel with moisturizers. Soap can be drying and oils can destroy your tan. How long do I have to wait to wash my hands after my spray tan? Water removes your tan, so we do NOT recommend washing hands for at least 3-4 hours. Give the solution some time to develop. In the meantime feel free to use baby wipes or hand sanitizer to keep the germs away. Washing hands too soon can result in your hands looking white in contrast to your newly tanned wrists. It’s a tell-tale sign of a spray tan, for the most natural spray tan, avoid washing too soon. What should I wear before, during and after my spray tan? How to dress for your spray tanning session, is easy but many clients make critical mistakes. Always wear loose fitting clothes, avoid tight garments, especially tight athletic wear and sports bras. They will rub off your tan, can make you sweat off your tan and create tan lines. If possible wear loose long pants and a long tee or hoodie to protect your new glow from rain, water spills, and pets that love to lick. Avoid shoes that make your feet sweat. Once your tan has developed and you’ve showered you can resume normal activity. Just keep in mind that tight-fitting clothes, like sports bras, can still rub off your tan. The tan itself is part of the top layer of skin only so anything that rubs the skin can remove the tan. Will my clothes get ruined from spray tan solution? No, BronzedBerry spray tan solution will not stain clothes but other brands might. BronzedBerry’s tanning solution contains NO DYES but other brands are full of red, blue and yellow dyes so be certain to ask your Artist. The makeup that is added to our solution is a food grade caramel and will not stain your clothes. We recommend washing them within 24 hours if you wear anything white, as sometimes white elastic actually absorbs the tanning ingredient and can begin to turn a color. Since clients shower prior to putting on a wedding dress, the solution is gone and there is nothing left to stain it. Dresses that have corsets built in will tightly rub on brides underneath the dress below the armpit. Some brides have said that skin residue, little brown sweat marks have appeared INSIDE the dress under the armpits. It comes out when the dress is cleaned. SCCS, Scientific Committees 2010 in depth study analyzes potential health risks from DHA exposure. The exposure tested ranged from skin contact, lung inhalation as well as contact with mucus membranes. More info with link to report, click here. How can I extend the life of my spray tan? To make a spray tan last longer, keep your skin hydrated (drink plenty of water), use a good simple lotion (no alcohol or fragrances), avoid rubbing oil on the skin and stay out of pools and spas. Don’t rub your skin after a shower, pat it dry. Also, add a sunless tanning cream or spray to your routine beginning on day 3 of your spray tan. If used every couple of days, you can get up to 2 weeks out of your original spray tan. Take a look at our products here. We believe it is with BronzedBerry products and tanning solutions. We prefer you wait until you are in your second trimester. While there is no research to suggest any problems with spray tanning prior to that, most Doctors agree that limiting your exposure to anything new in your first trimester is a good thing. That being said we are happy to declare that our solution is safe and non-toxic. We use certified organic ingredients, and the solution penetrates the top layer of skin. Our technique uses significantly less solution than many other competitors products and services. We will cater to your needs. If you prefer to avoid spraying your belly, we are happy to accommodate. More info on pregnant spray tanning and its safety with links to expert opinion, click here. I’m breastfeeding, is it still safe to spray tan? We love babies and mamas and can accommodate nursing moms. While BronzedBerry solution is non-toxic we do have a few tips to help you go the extra mile. Use a sticky bra or sicky cups and avoid solution, or ask your Artist not to spray your chest area. Another simple and easy tip is to simply wipe the area with a baby wipe after your session. This will remove the tanning solution from any parts that the baby will put in their mouth. Lay a blanket or shirt across your belly so that while your little one is nursing you can avoid skin on skin contact so they don’t get little tan fingers and toes. Wipe down baby with a baby wipe to ensure no solution develops on their perfect little bodies. Looking for more info on breastfeeding and spray tanning, click here. Is there anything about spray tanning that I should be cautious about? We tan each client in a mobile tent that is completely open in the front. This allows the client to breathe freely and have plenty of fresh oxygen. Unlike booth spray tans, you will not be forced to inhale tanning solution. Before we spray a client’s face, we give them time to close their eyes and hold their breath, approximately 3 seconds. Clients may also choose to avoid facial spray tanning altogether. Some competitors’ solutions contain alcohol, lead, and arsenic. It is important that you ask anyone tanning you about their solution. If they can’t show you a label with ingredients on it, we suggest you stay away. Also, keep in mind lead and arsenic will never be listed on the label. Usually, they are incorporated into products in the form a fragrance which the FDA does NOT require to be listed on labels. It’s best to make sure that you trust the company and Artist you are working with. My spray tan got wet, how do I fix my streaky tan? Everyone makes mistakes. Sometimes a rain storm just can’t be avoided. No worries, with our Extend lotion or Classic Tan Can you fix this up in a jiffy. Our Artists stock these products so if you’ve run into a bad situation, find an artist near you (artist search tool) and grab one of these asap. Fix a streaky or messed up spray tan with Extend, how to instructions click here. Fix a streaky or messed up spray tan with Classic Tan Can, how to instructions & video click here. Does working out ruin a spray tan? A spray tan can easily be incorporated into your life, but remember that activity can reduce the life of your tan. Working out and sweating should only be done after your tan has developed and you have taken your first shower. Do not work out with tanning solution on your skin. When working out try and wear loose fitting clothes that won’t rub your skin and remove your tan. Sports bras are notorious for creating tan lines, so keep that in mind. Touch up your spray tan with our Extend Lotion, it will tan you in one application. Simply rub onto any part of your body that you want to tan, let develop (about 8-10 hours) and go. What type of moisturizer and lotion should I use after my spray tan? Our experience tells us that simple body lotion is best. Take a look at the ingredients, if alcohol is on the top 4 ingredients, avoid that lotion! Lotions that combine natural ingredients like shea butter, nut oils, glycerin and essential oils are best. Fragrances can be packed full of nasty ingredients, which can actually dry your skin out, the opposite of what you are trying to accomplish. Lotions made with natural ingredients should provide superior results. Avoid anything that is alcohol based as well as straight oils. While coconut and argan oils are amazing the problem is that oils by themselves can deteriorate and break down the spray tan. Oils inside lotions are fantastic! All and every spray tan solution on the market contains DHA (click here to read about its safety), which is the ingredient that actually tans the skin. It requires time to develop (how long depends on brand and type). Most tanning solutions will need to be left on between 8-10 hours to develop properly. Getting wet before this, like washing hands, sweating or getting rained on, can remove the tanning solution from those areas and can result in an uneven or blotchy look. Using a rapid, or quick tanning solution does not mean you will tan faster! This is a common misconception. All DHA can actively develop up to 24 hours after it’s application, even if it’s washed off, it can still be working. Tanning solutions that can be washed off quickly will still require 8-10 hours to develop (before you see results). Do not be concerned if you chose a rapid solution, showered and it appears you have no results, it can take up to a day to show. Usually, these tans are lighter and will also only last a few days.